ConnectShip offers a variety of training courses to assist our partners and customers with using our solutions to their full potential in order to be more productive and competitive within the industry. Amongst our available courses is a 4-day, instructor led Introduction to ConnectShip Toolkit training course. In this classroom-style course ConnectShip instructors lecture and perform demonstrations of installation, configuration, and customization possibilities of our solutions in our Tulsa, OK training facility. Trainees are guided through installation on individual training machines before being asked to configure Toolkit on their own. 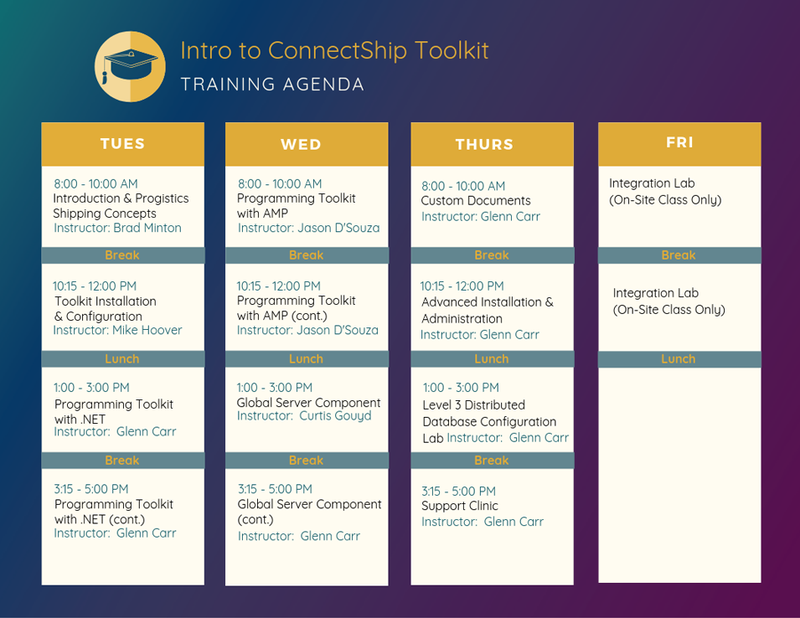 The Introductory training course is crucial for anyone new to using the ConnectShip software. Graduation from the on-site training course puts participants on the fast track to becoming an official ConnectShip Progistics Technology Engineer (CPTE). Those who have completed the on-site training course and signed the CPTE agreement are eligible to take the CPTE exam which can be scheduled with the training coordinator. An additional CPTE exam fee applies. Call 918.461.4491 for further details. The Introduction to ConnectShip Toolkit training course is available in a convenient 3-day online format. The instructor led, live, online format provides the same content as our onsite Introduction to Toolkit course but without the fourth day lab exercises. In addition to the Online Introduction to Toolkit training course, we also offer a one-day Online Advanced Progistics Administration course. The Advanced Progistics Administration course includes introductory topics such as an overview of Progistics terms and concepts and a tour of the Progistics SDK, as well as advanced topics such as Progistics installation and configuration, AMP configuration, and data maintenance, among other topics. Demos and labs are both included in the one-day course. The Advanced Administration course is intended for IT specialists and Network Administrators responsible for maintaining the ConnectShip server environment within their corporate data centers. All online classes require prior experience with ConnectShip solutions. This ensures that everyone in the online class can keep pace with the instructors and fellow trainees.